Tired of having a mediocre lawn? Contact Northeast Ohio’s go-to lawn service providers—Lawn Control Center! We offer an array of lawn care services to help you get and maintain a beautiful, green, and healthy lawn. One key service we use to keep your lawn in good health is through lawn aeration. Lawn aeration reduces compaction and helps the newly placed seeds find their way into the soil and help promote grass growth in bare or thin spots on your lawn. If your lawn isn’t as lush as you think it should be, you may benefit from aeration services. Contact Lawn Control Center today to learn more! Lawn aeration, often called core aeration, is the process of removing small cores from your lawn to help reduce compaction and thatching. By opening up the soil, elements such as lawn fertilizer, nutrients, water, and air have an easier time reaching the roots of your turf. This will ensure your lawn’s roots can extend and help the grass maintain its health. 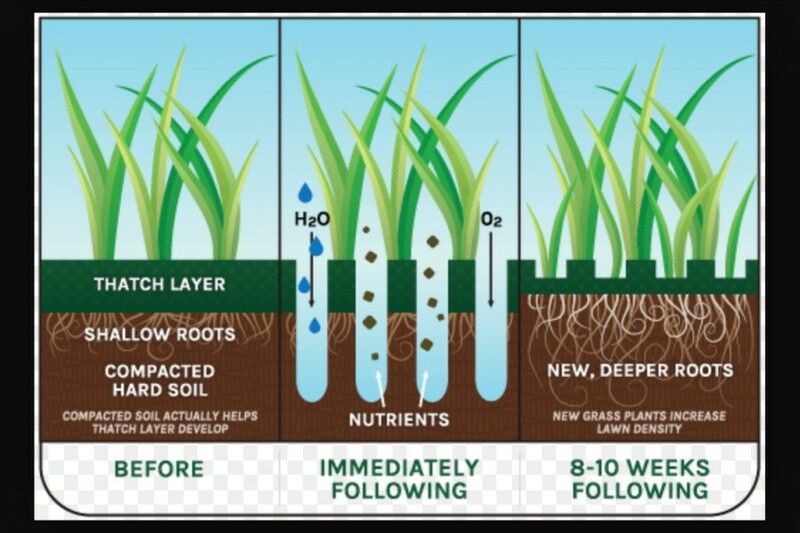 To ensure water and nutrients are reaching deep into the soil and assisting the roots, most experts suggest that you aerate your lawn every one to three years. This frequency changes if you have pets or kids who consistently are running around the grass and compacting the soil—in this case, twice per year can be quite a common recommendation. Our lawn technicians will be able to monitor your lawn and its ability to soak in the fertilizer and water and let you know if aeration would significantly increase results. 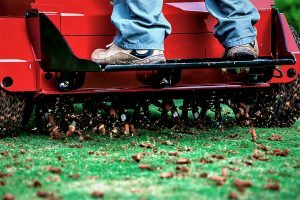 The ideal time for core aeration is early in the spring or late in the fall when the soil is most likely compacted. During the spring and summer when rain and warm weather is the norm, the ground is softer and, therefore, more susceptible to letting water and nutrients sink downward. Lawn aeration in the fall—in combination with lawn fertilizer services—will keep the fertilizer inside the soil throughout the winter whereas a spring aeration will help loosen up the topsoil and let the grass flourish after the first treatment. At Lawn Control Center, we offer a hassle-free program to keep your lawn looking great. By consistently monitoring the property, we will be able to spot treat everything from pest control to weed control to bare spots. Being hassle free also means we will not harass you with phone calls trying to sell services you don’t need. When it comes to lawn aeration services, we can advise you if we feel you would benefit from the program. If you have never had lawn aeration for your grass or you are looking for a new and more dependable lawn care company to provide you with this crucial and beneficial service, give Lawn Control Center a call. We have the experience, expertise, and commitment to help you get and maintain the lush and healthy lawn you deserve. Lawn Control Center has been serving residential and commercial properties since 1999, and the crews at all of our offices are highly trained and will provide lawn care services professionally and diligently. We treat each client and lawn individually. When you partner with us, we treat you like you are our only client. During our consultation and initial assessment, we will customize a program tailored specifically to your unique lawn care needs. Contact us today to learn more or to schedule your lawn service.